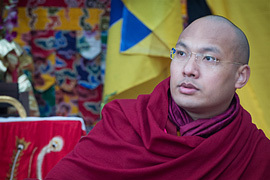 His Holiness the Sixteenth Gyalwa Karmapa, Rangjung Rigpe Dorje, holder of the sacred treasure of Vajradhara, founded Rumtek Dharma Chakra Centre in Sikkim as his main seat-in-exile outside Tibet. 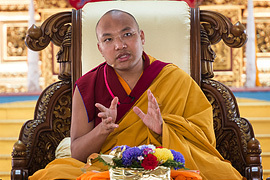 As the supreme head of the Kagyu order of Tibetan Buddhism, the Karmapa embodies, represents, and guides its accumulated spiritual energy. 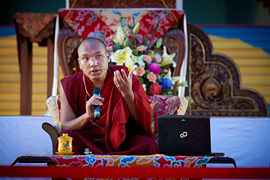 Karma means 'activity', and the Gyalwa Karmapa embodies the activity of all the buddhas of the ten directions. 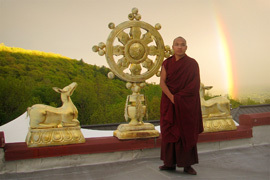 The Karma Kagyu lineage was begun by the First Karmapa, Dusum Khyenpa (b. 1110), in the twelfth century. Prophesied by Buddha Shakyamuni in the Samadhirajasutra, the accomplishments of Dusum Khyenpa were so great that he was declared to be the "Knower of Three Times." 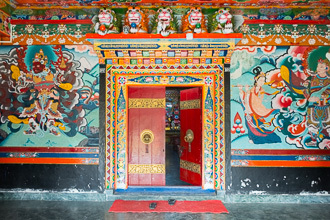 He established Tsurphu Monastery in central Tibet as the seat of all the Gyalwa Karmapas in 1185. 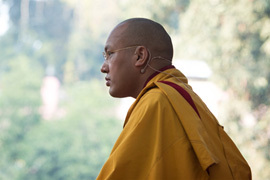 Each Karmapa incarnation possesses the unique ability to predict detailed circumstances of his next rebirth, usually revealed in a letter to be opened after his death. 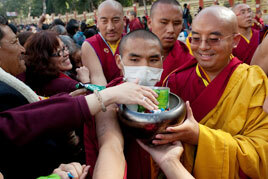 Dusum Khyenpa was the first Karmapa to predict the time and place of his rebirth, and his reincarnation, Karma Pakshi (b. 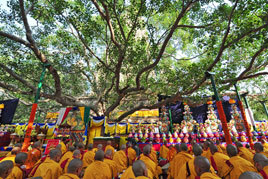 1204), was the first tulku (reincarnate lama) ever recognized in Tibet. The profound wisdom of the Kagyu lineage has been passed down from incarnation to incarnation and like his predecessors, the Sixteenth Gyalwa Karmapa was primarily a spiritual figure who propagated the causes of buddhadharma, humanity, and world peace. Born in eastern Tibet in 1924 to a noble family, he was recognized as the Karmapa incarnation in accord with a prediction letter written by the previous Karmapa, and enthroned when he was eight years old. 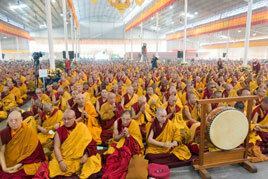 The recognition of the Sixteenth Karmapa was officially confirmed by His Holiness the Thirteenth Dalai Lama. 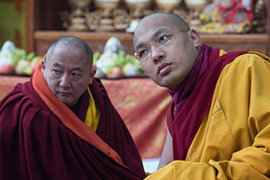 When the Communists began to occupy Tibet during the 1950s, the Karmapa realized he would have to leave the country to preserve the accumulated spiritual legacy of the Karma Kagyu. 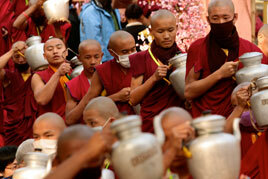 During the 1959 uprising, he left Tsurphu Monastery with a group of 150 tulkus, lamas, monks, and lay followers. 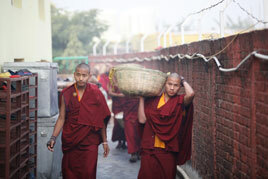 Carrying spiritual treasures, relics, and texts that had been collected at Tsurphu for 700 years, they made the long and difficult journey to India through Bhutan. 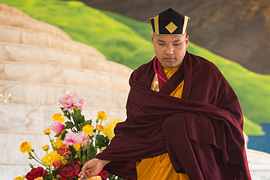 On reaching the Indian border town of Buxa Duar, the Karmapa received an invitation from His Majesty Chogyal Tashi Namgyal, the king of Sikkim, to establish a new seat in that country. The Karmapa accepted, continuing a very long religious and spiritual relationship between the Gyalwa Karmapas and the kingdom of Sikkim. 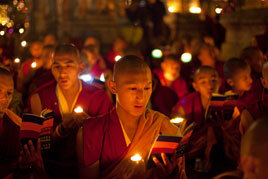 Centuries earlier, the fourth Sikkimese Chogyal asked the Ninth Karmapa, Wangchuk Dorje (b. 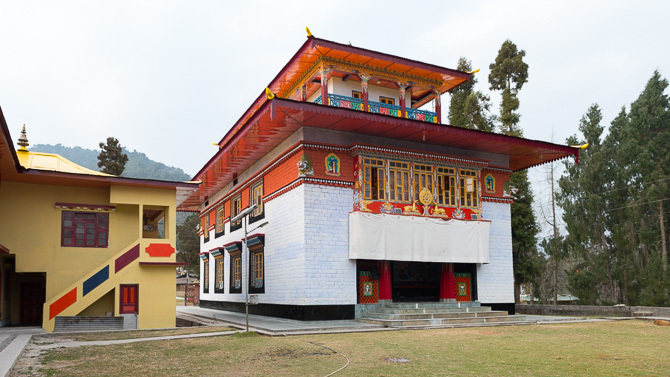 1556), to build monasteries in Sikkim, long considered an exceptionally holy place by Tibetan Buddhists and now home to many ancient Kagyu monasteries. 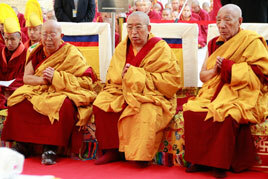 Three of these--Ralang, Phodang, and Rumtek--were founded under the auspices of the Ninth Karmapa. It was at the old Rumtek Monastery, then in disrepair, where the Sixteenth Karmapa stayed before establishing Rumtek Dharma Chakra Centre. 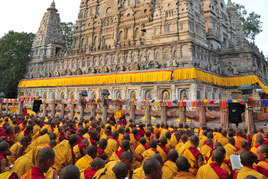 Work on the new monastic complex began in 1961 and was completed in 1966. 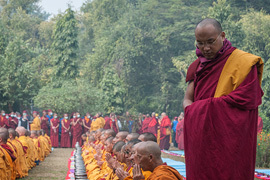 The Karmapa worked tirelessly from his international headquarters at Rumtek Dharma Chakra Centre to disseminate the dharma, and undertook two world tours in the 1970s to spread the teachings. He passed into parinirvana in 1981, leaving a prediction letter found by one of his regents, His Eminence the Twelfth Situ Rinpoche. 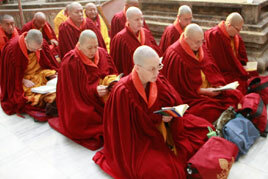 The Seventeenth Gyalwa Karmapa, Ogyen Trinley Dorje, was found in Tibet according to the letter, and his recognition was confirmed by His Holiness the Fourteenth Dalai Lama, spiritual and temporal leader of Tibet. 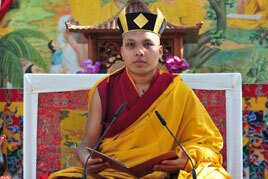 The Karmapa was enthroned at Tsurphu Monastery on September 27, 1992 and began his formal studies and training. 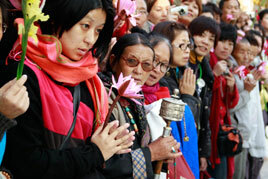 Devotees travelled to Tsurphu from throughout Tibet and all over the world to receive his blessings. 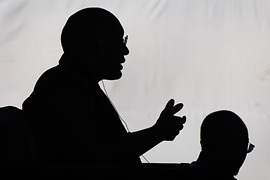 Karmapa Ogyen Trinley Dorje made a daring escape from Tsurphu to Dharamsala, India in late December 1999 that captured the attention of the world. 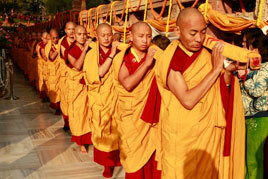 He was warmly received in Dharamsala by His Holiness the Dalai Lama, with whom a strong bond has developed. 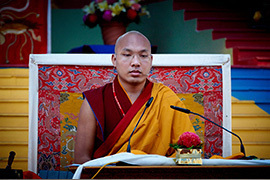 The Karmapa remains in temporary residence at Gyuto Ramoche Tantric University near Dharamsala, receiving teachings and transmissions from eminent Kagyu masters while the Indian government considers his request for asylum. 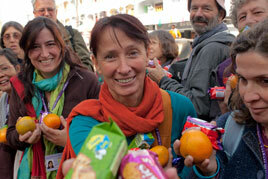 Followers from around the world now travel to India to receive his blessings. One of His Holiness's regents, His Eminence the Twelfth Goshir Gyaltsab Rinpoche, is overseeing activities at Rumtek Dharma Chakra Centre until His Holiness Karmapa Ogyen Trinley Dorje returns.